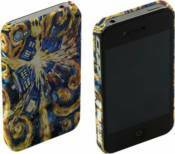 Doctor Who Van Gogh Exploding TARDIS iPhone 4 Case:Yikes! The TARDIS is exploding! The Doctor Who Van Gogh Exploding TARDIS iPhone 4 Case gives you a totally unique case for your iPhone. How cool is that?